I’ve received a press release from the Getty announcing it will voluntarily return this terracotta head to Italy, specifically Sicily. It depicts the god Hades, and may date to 400-300 B.C. The language of the release is careful and I guess serves its purpose. I wonder if there is room here for an analysis of the shape and form that these press releases. I think so. Think about how it differs and resists the words we often use to describe this activity. The words ‘repatriation’, ‘Italy’, ‘looting’, and even ‘crime’, are not mentioned. But despite the problem I have with the language, it appears from the release as if the Getty is doing cultural justice here. The object was looted and it is returning home soon. But I’m left wondering how many other objects from sites like Morgantina does the Getty retain. The release ties the return to the discovery of physical evidence at the site, and connects this with the object. But what about the contemporary evidence like who bought the object from who and what questions were asked when an object was acquired. We know from investigative reporting like Chasing Aphrodite how little inquiry was made. But this would be so much more direct, cheaper and useful than elaborate scientific tests. My rule of thumb when visiting a museum is, if they don’t tell you about the history of an object, there is very good chance it was looted. This head will be transferred over to the Archaeological Museum in Aidone, where it will likely be displayed near “la dea di Aidone” previously known as the Getty goddess, returned in 2010. 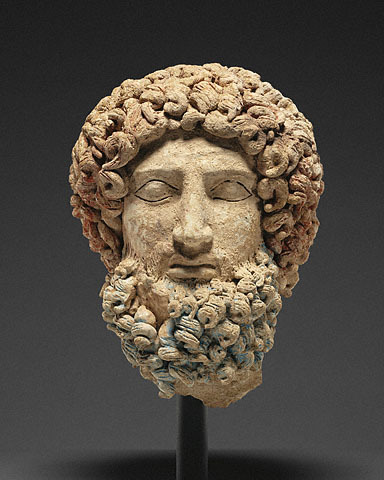 The head first will be a part of a Getty-organized traveling exhibition titled “Sicily: Art and Invention between Greece and Rome” which will start at the Getty, stop off at the Clevelend Museum of Art, and culminate in Palermo in June 2014. Previous Previous post: Student Note on "Cultural Revival in the New Libya"